A Bursitis is an inflamed bursa. The inflammation can be a result of friction from the overlying tendons. A bursa is mostly flattened and is filled with a thin layer of synovial fluid. It appears for example at a junction of a tendon on the bone. The iliopsoas bursa separates the muscle or tendon from bone and facilitates movement by reducing friction between the anterior hip capsule and the iliopsoas. The iliopsoas bursitis is one of the affections related to anterior hip pain. 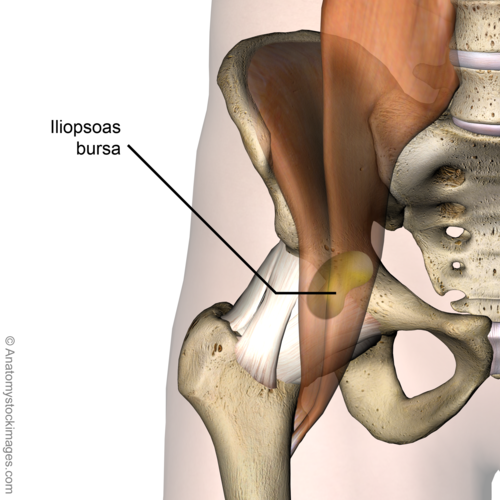 The iliopsoas bursa is the largest bursa of the human body and is bilaterally present in 98% of adults. This bursa is bounded by the musculotendinous junction of the M. iliopsoas (anteriorly) and by the fibrous capsule of the hip (posteriorly). It extends from the inguinal ligament superiorly to the lesser trochanter inferiorly and is flanked by the femoral vessels (medially) and the femoral nerve (laterally). The bursa is always collapsed, when in healthy condition. In some situations the bursa is enlarged and contains fluid. When enlarged, it may cause a variety of symptoms such as pain, and immobility. Iliopsoas bursitis is mainly caused by rheumatoid arthritis, acute trauma and overuse injury. When an acute or chronic occupational trauma incurred during sport activities, a bursitis is likely the result of multiple mini-traumas caused by vigorous hip flexion and extension. Iliopsoas bursitis is commonly seen in individuals participating in strength training, rowing, uphill running and competitive track and field. There are a few theories concerning the origin of symptoms of iliopsoas bursitis. One of them points that when the hip is in flexion, both the iliopsoas muscle and the anterior part of the bursa move away from the hip joint. If the hip is to be hyperextended suddenly, there is a great tension that stretches the muscle and the bursa. This stretching traumatizes the bursa. Another theory hypothesizes that when a flexed, abducted and externally rotated hip, with iliopsoas bursitis, is brought in an extension, it causes an interruption of the lateral to medial movement of the iliopsoas tendon. This results in a painful snapping of the tendon over the femoral head, and over the anterior hip capsule. Inevitably, iliopsoas bursitis and tendinitis are interrelated, where inflammation of the one will result in inflammation of the other because of their close proximity. In their presentation, etiology and treatment, the two conditions are almost identical. Together it is called the iliopsoas syndrome. Pain radiated into the knee, leg and lower back. Tenderness in the upper quads (M. Quadriceps). A snapping sensation at the front of the hip. Pain develops during walking or specific movements like crossing the legs. Pain on hip flexion, resisted as well as passive. Pain on internal rotation or passive hyperextension. Stiffness or pain after a rest or in the mornings. Pain is worse while performing activities. Rest can relieve the pain. Several joint diseases can cause distension: Osteoarthritis, Rheumatoid arthritis, Avascular necrosis, Pigmente villonodular synovitis, Synovial chondromatosis, Gout, Chondrocalcinosis, Trauma, Lupus erythematodes, Pyogenic infection, Snapping hip. Iliopsoas bursitis is often under-diagnosed due to its unspecific symptomatology. Careful and deep palpation in the femoral triangle medial or lateral to the femoral artery, with pressure applied on the bursa will result in pain. To elicit a patient’s hip pain, a clinical maneuver is commonly used. It involves the extension of their flexed, abducted and externally rotated hip where a tangible or audible ‘snap’ in the hip is almost always noted. It is also possible that the inguinal region is painful when palpating it. A known or suspected osteoarthritis, snapping hip syndrome and a palpable inguinal or pelvic mass could raise the suspicion of an inflamed iliopsoas bursa and lead to further imaging examinations. To exclude other possible hip problems, and to get a more realistic idea about the size of the bursa, a 3D image is recommended, preferably an MRI-scan. The MRI-scan can distinguish the iliopsoas bursitis from other possible problems such as a tumor, a hernia, a hematoma and an aneurysm. However, a musculoskeletal ultrasound is the most cost-efficient way. Other frequently used options are to exclude problems of the bone are an X-ray and a bone scan. The computed tomography or CT-scan is also a commonly used instrument. Movement: The patient feels pain in the anteromedial aspect of the thigh when doing a hip flexion and internal rotation. There is a limitation in range of motion (ROM) according to a non-capsular pattern. Flexion is lightly painful at the end of ROM. Sometimes pain can be felt at the end of ROM when extension or adduction is performed. The most painful movement is adduction with the hip in flexion. Palpation: bursitis can be palpated as an oedematous mass in the groin region. A palpable and/or audible snap can be present. (level of evidence: A1)Tenderness in femoral triangle. Active resisted testing of the iliopsoas. Traditionally the initial treatment of iliopsoas bursitis includes rest, stretching of the hip flexor muscles, strengthening exercises of the hip rotators and physical therapy. Generally successful stretching exercises to alleviate or ease the symptoms are the ones involving a hip extension, done for 6 to 8 weeks. The stretching program has to continue at least as long as the pain is present. The patients also have to avoid the aggravating activity of sports as much as possible during the initial treatment. (Level of Evidence: 1A). The clinical practice of exercise therapy as a major component of rehabilitation for groin pain in athletes continues to be supported by the available evidence to date. Exercise, particularly strengthening exercises of the hip and abdominal muscles, could be an effective intervention for patients suffering from groin pain, thus iliopsoas bursitis or iliopsoas syndrome. Although literature provides foundational evidence that the exercises should be performed as static to functional, regarding the most effective intensity and frequency of exercise, there is no clear evidence due to lack of reporting. ↑ 2.0 2.1 Van de Perre, S., Vanwambeke, K., Vanhoenacker, F.M., & De Schepper, A.M., (2005). Posttraumatic iliopsoas bursitis. Journal Belge de Radiologie – Belgisch Tijdschrift voor Radiologie, 88, 154-155. ↑ Wyss, J., & Patel, A. (2013). Therapeutic programs for musculoskeletal disorders. New York, NY: Demos Medical Publishing.